Come on Europe Ltd. is an online gambling business that offers many types of betting services such as casino betting, poker, and sports betting services. The main brand of the company is Come On online booking site founded by Swedish owners. As the name suggests the company is mainly targeting online gambling players from Europe. The company is licensed and operates under the laws of Malta, and some of their affiliates are registered in Curacao. US gamblers will be disappointed to find out that the company doesn’t allow any players from the United States to register or bet in their online platforms. Come On have specialized in offering the best Adobe Flash gambling platforms aiming to be fast and user-friendly for all their customers. 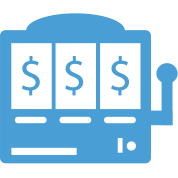 The bookmaker is a good choice for dedicated sports betting enthusiasts. The company is still in its early stages of development, but this could be a chance for many to enjoy a fine sports betting provider with a fine audience and financial stability. When you first enter the site you’ll be presented with a very welcoming home screen where the company will offer you a great bonus for registering. Everything about the interface is made really smart and you won’t find any problems to register or reach the market you’re looking to bet on. You can choose to enter sports, casino, live betting or the live casino. In the sports section you’ll find a huge amount of markets which begin with the top events (of course meaning top soccer events because the site is targeting mainly Europe customers). Under the “Top events’” section you’ll find a really deep sports section where even Chess, Surfing, E-sports and Badminton markets are available. A very useful option is the Bet search where you can quickly find every sport that you’re looking for and want to bet on. There is also a suggestion from the site employees on a Quick Bet that is different depending on the day you choose to play. As we already mentioned, live betting is available on Soccer, Tennis or other major sporting events (like Ice hockey for example. Major political and entertainment events are also supported with US president elections in 2016 being one of the most famous ones. Being one of the best top 50 betting platforms in the world you would expect to find out that there is on the go mobile platform support, and you’ll be right. ComeOn betting has got you covered, no matter if you use Android or IOS. Other gambling choices are also supported. 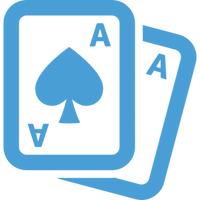 ComeOn offers amazing opportunities for poker and casino players. All users can enjoy roulette, blackjack, slots, video poker and many other small games to enhance their gaming experience. Odds in ComeOn betting are very good and all kinds of markets are available for all sporting events. As a European platform odds for soccer are very well covered with up to 150 wagers on a major sporting event. Markets as match winner, over and under 2.5, both team to score and Asian handicap are available. There are also “Specials” as multi-bet score, both teams to score and O/U 2.5 and many more. Other odds as Goals, Corners, Cards and leagues bets are also available. Despite the fact that US players are not allowed you can find a lot of betting markets on sports like Baseball and NFL. Money line, run line and over under are available for baseball and spreads are available for NBA and NFLS bets. Odd formats supported are Decimal, UK and American. You can set them from the bottom left corner of the site. ComeOn betting has reached top of the bookmakers review sites for a reason and that’s their excellent customer support service. Leaving aside the SSL encryption that protects user data from malicious hacking attempts the site has made sure all users have an enjoyable and safe experience. Company’s employees are available to contact 24/7 for questions concerning the betting or site experience. A live chat service is available for customers looking to resolve their problems right away. Other methods to contact the site are email and phone. A “Type your questions or keywords” option is also available which brings a very new approach to customer support services. The site is part of the “Responsible gambling” movement that fights gambling addiction across the world. The site aims to build a safe and enjoyable relationship with their customers. They offer the “Long” or “Short” exclusion options that can help players overcome their gambling addiction. 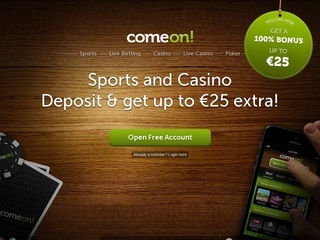 Major betting sites such as ComeOn have made sure they offer a large amount of depositing methods for their customers. The very well-known debit/credit card and bank wire methods are available. Others like digital wallets are also available. Withdrawal methods tend to be the same as the deposit ones but they have some minor limitations. Withdrawal times are a big plus to the site where you can receive your funds in a matter of 24 hours when using E-Wallets and 3 to 5 days using other methods such as Bank Transfer. Maximum withdrawal limit is set to 11 000 EUR per withdrawal, which is also nice. Supported currencies are listed in the table, so you can carefully review them and find your favorite. Despite the non-us players rule US dollars are also accepted. To keep their players entertained and keen on gambling the site offers a lot of promotions for new and already registered players. They have 100% bonus offer for up to 25 Euro on Sports and Casino. This bonus is eligible for all players making their first deposit. 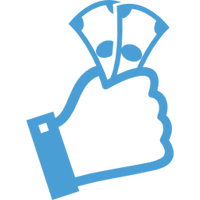 Once registered in the site you start to earn points for every bet you make there in the casino or at sporting events. You can later trade these points on lotteries or merchandise.